I'm incredibly honored and grateful that Kellogg ran a 4 page feature article on Ben's Friends in this Summer's Kellogg Alumni Magazine. We share a little bit of the print space with another social impact company but most of it is about Ben's Friends. In the print version, there is a whole timeline which starts when Ben entered Kellogg in 05' and shows all of our progress annually. It feels so wonderful to be recognized by my alma mater! 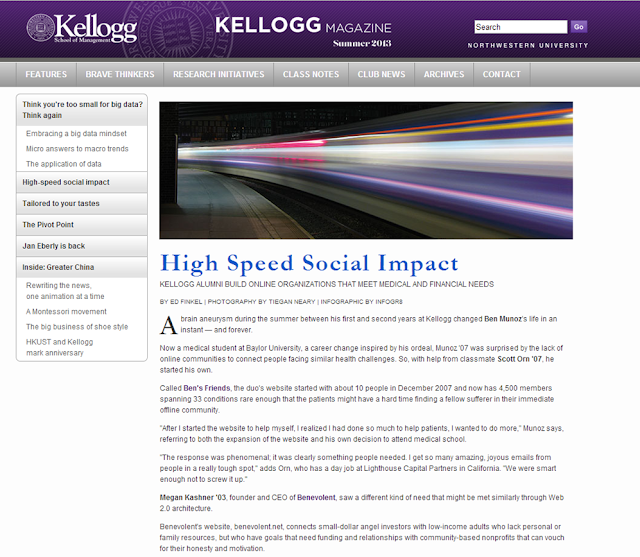 The article also means a lot because so many of our donors have been Kellogg alums. I love seeing them get paid back emotionally for all the help and resources they give us so we can keep going. Thanks to all our Donors! This one is for you!